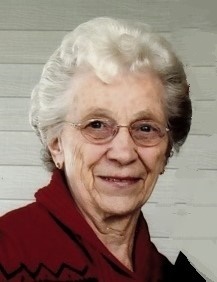 Margaret Ann Vondran, 89, of Galena, IL passed away Sunday, February 3, 2019, at Galena Stauss Senior Care Community. A private wake service for family and relatives will be held Wednesday, February 6, 2019, at St. Mary’s Catholic Church, Galena beginning at 10 AM until the time of the funeral mass at 11 AM. Burial will be in the church cemetery. The Furlong Funeral Chapel, Galena is assisting the family. She was born May 5, 1929, in Colesburg, IA the daughter of William and Cecelia (Fangman) Pasker. Margaret was united in marriage to Jerome “Jerry” Vondran on November 8, 1949, at St. Patrick’s Catholic Church, Colesburg. She was employed for twenty-eight years in the business office of the original Galena Hospital. Margaret was a homemaker and spent many years as the head of St. Mary’s Altar and Rosary funeral luncheon committee. She enjoyed quilting, dancing, playing cards, and bowling. Margaret was a member of St. Mary’s Catholic Church and the Altar and Rosary Society. She was a loving wife, mother, grandmother and great grandmother and will be dearly missed by her family. She is survived by her husband, Jerry, her four children, Diane (Bob) Wachter, Denis (Susan) Vondran, Gary (Vicky) Vondran and Mary (Danny) Spillane, eleven grandchildren, twenty-two great-grandchildren, three sisters-in-law, and many special nieces and nephews. She was preceded in death by her parents, three grandchildren, five brothers, three sisters, and her brother and sisters-in-law. The family wishes to extend a special thank you to the staff at Galena Stauss Senior Care Community and Dr. Vandigo for your care and compassion during this difficult time.